Welcome, all new and old customers! Our website is updated with new design and many new functions. Improved search functions and well-arranged category menus will make it easier for you to find what you are looking for. The first time you are shopping on this new web site, you have to register as a customer. This simplifies ordering now and on your future visits. Familiarize yourself with all that is new on our site, and feel free to give us feedback. Praise and blame alike. 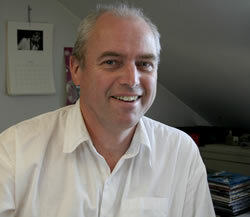 Bo Ejeby Förlag publishes sheet music and books on music. On Footprint Records we also produce CD’s. Ejeby.se can supply sheet music, CD’s and books on music from all over the world. Regrettably, we have not been able to translate everything on our web site into English. So, do not hesitate to contact us us if you want to know more! The name Bo Ejeby Förlag reflects a simple fact: I publish books and music that interests me on a personal level – publications that I feel are important and of great value. The books are about music, primarily music of our age, about experiencing music, about musicians and composers, about the history of music and about making music. The sheet music is mainly made up of choral music, arrangements of ballads and popular songs as well as original contemporary music. But there are also a few song books. I have a great many years of experience in Swedish choral music, particularly the one found in Göteborg. This is why my publications are dominated by choral music. Prior to starting my publishing firm, I studied to become a teacher of Swedish and music. I then worked five years at a folk high school and ten years at the publishing company Korpen. I follow up my publications by personally serving my customers by phone, mail or e-mail. Orders are generally shipped within the day. I hope that this web site will further improve my contacts with old and new customers.